a maximum of 5 ingredients and take minutes to put together. 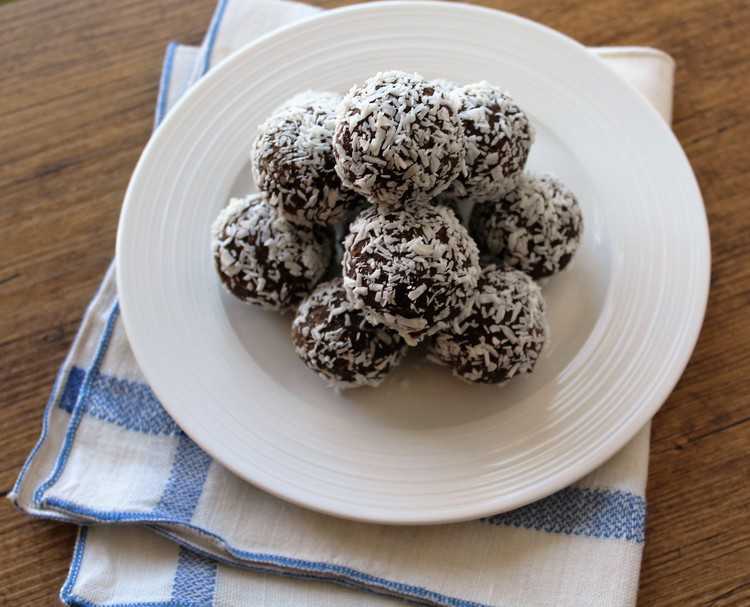 They contain no sugar at all but the combination of dates, nuts and cocoa will be sure to satisfy your sweet tooth. 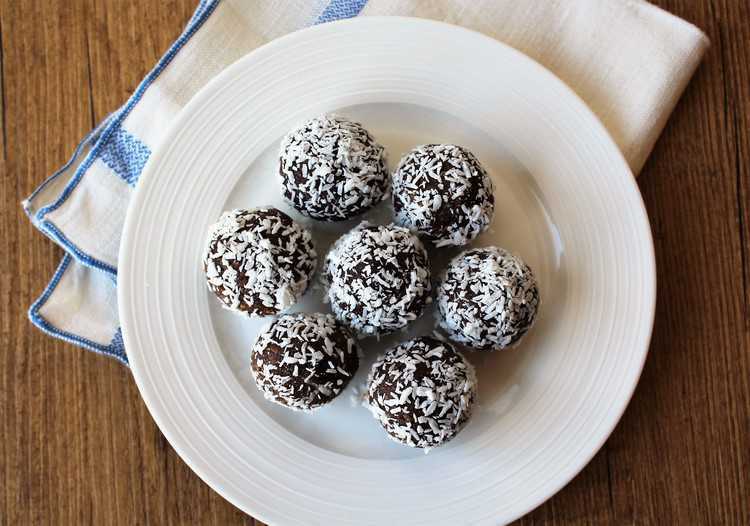 They are also quite filling so they’re the perfect morning or afternoon snack when you need a little pick me up. 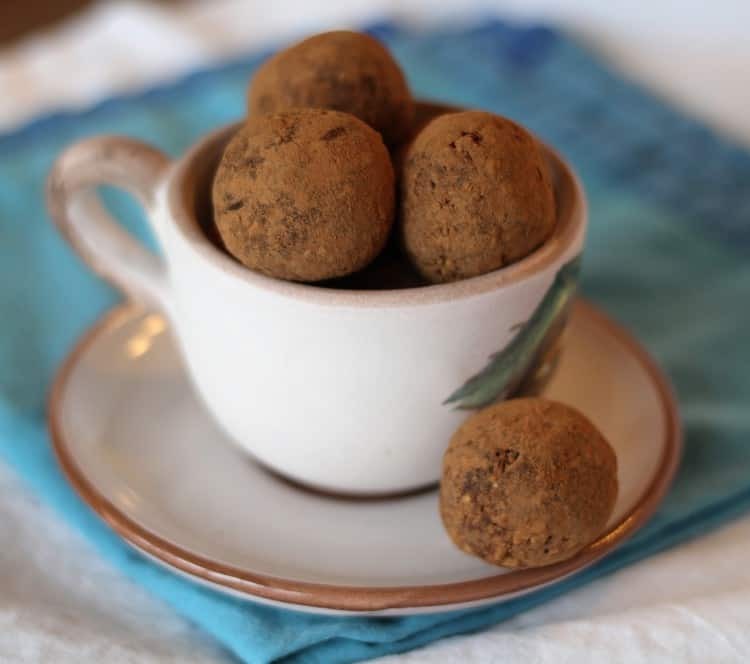 They are also gluten free and vegan so they’re perfect for those with specific dietary needs. 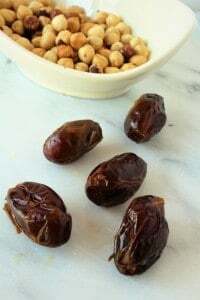 The only prepping involved consists of toasting the nuts in the oven and soaking the dates in boiling water for 10 minutes. Then, everything goes into your food processor and your ready to roll the truffles. We prefer eating them chilled, so I’ll put them in the refrigerator for at least half an hour before serving. 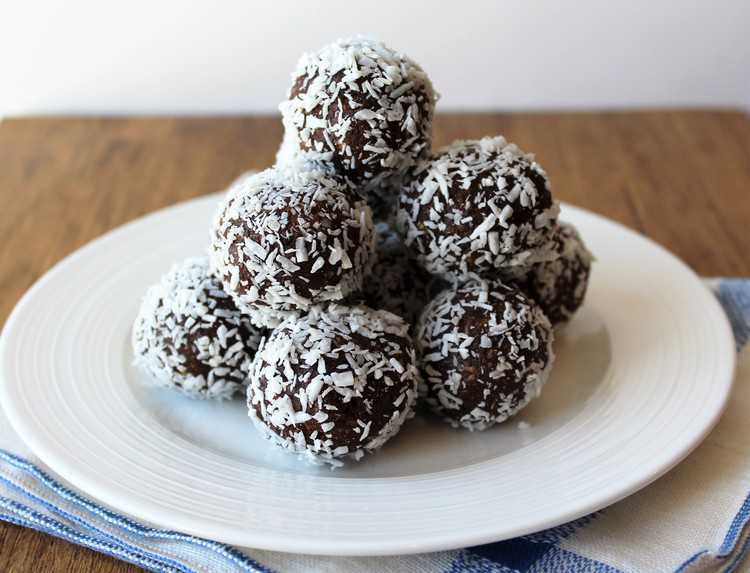 The first time I bit into the coconut covered truffle it was reminiscent of those little chocolate coconut covered doughnut holes I used to enjoy at a now defunct doughnut shop. They’re that good. And my kids like them too! Of course, I don’t have to tell you what the combination of hazelnut and cocoa reminds me of! They’re also quite pretty so I think they’d make an excellent hostess gift. I’m presenting you with 2 variations that I prefer but I’m already thinking about other combinations I’d like to try. 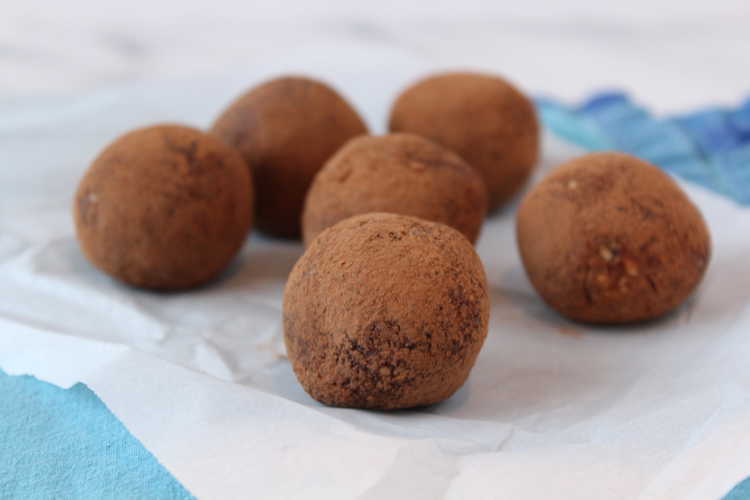 Let me know if you have any ideas about other ingredient combinations that would make excellent truffles. Preheat oven to 350° and toast hazelnuts for 15 minutes. Allow to cool. Meanwhile, in a small bowl, cover dates with boiling water and let sit for 10 minutes. When the hazelnuts are cool enough to handle, rub them between 2 paper towels or a clean tea towel in order to remove the papery skin. 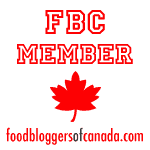 Drain the dates and place in the bowl of your food processor. Process until they form a thick paste. Add 1 cup hazelnuts and process until finely chopped. Add the cocoa powder and vanilla extract. The mixture will gather up into a ball. Transfer to a bowl and divide into 12 portions. Flatten each piece in the palm of your hand and place 1 hazelnut in the center. 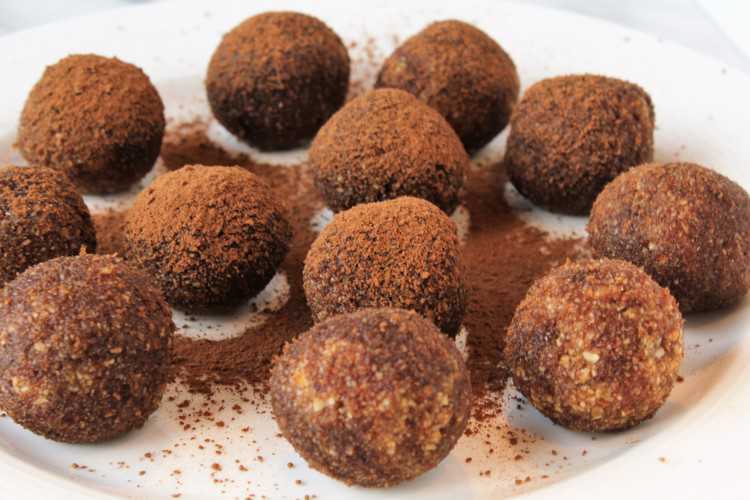 Use your fingers to cover the hazelnut with the date mixture and roll into a ball. Dust lightly with cocoa powder, shaking off excess powder. Refrigerate for at least half an hour before serving. 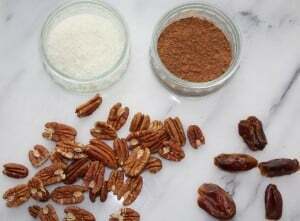 Use the same method as above, toasting the pecans and soaking the dates. 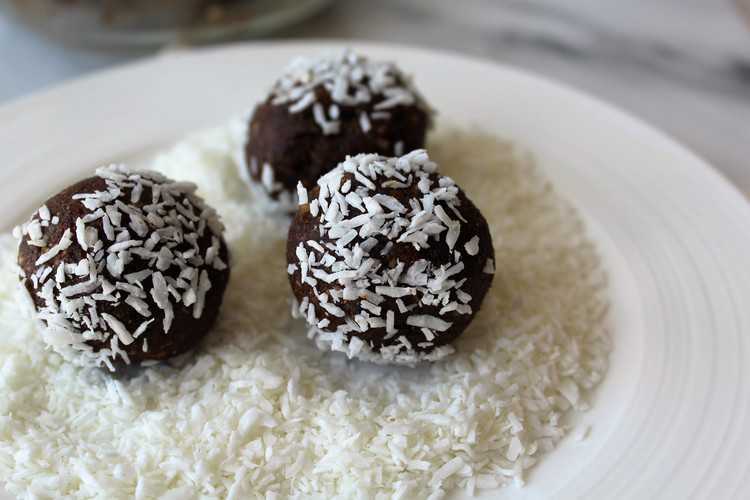 These truffles do not have a whole nut in the centre and are rolled in shredded coconut instead of cocoa powder. Love this idea, Nadia! I use a similar snack but certainly not as lovely. I put a roasted almond inside a date and voila! My morning or afternoon snack. I love the idea of giving these as a hostess snack. Can you come up with a nut free option so I can send it off to school as a treat? Good idea Pina, it would be great to include a nut free version in their lunch boxes. I've already started working on something. I'll keep you posted!